Clusters the data into k groups where k is predefined. Repeat steps 2, 3 and 4 until the same points are assigned to each cluster in consecutive rounds. K-Means is relatively an efficient method. However, we need to specify the number of clusters, in advance and the final results are sensitive to initialization and often terminates at a local optimum. Unfortunately there is no global theoretical method to find the optimal number of clusters. A practical approach is to compare the outcomes of multiple runs with different k and choose the best one based on a predefined criterion. In general, a large k probably decreases the error but increases the risk of overfitting. No change between iterations 3 and 4 has been noted. 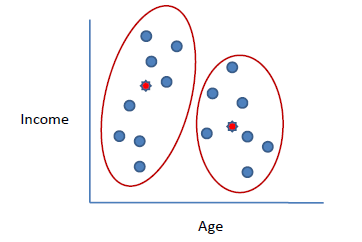 By using clustering, 2 groups have been identified 15-28 and 35-65. The initial choice of centroids can affect the output clusters, so the algorithm is often run multiple times with different starting conditions in order to get a fair view of what the clusters should be.